Based on the story Two Bad Hats by Monckton Hoffe, The Lady Eve is the story of a con artist who boards an ocean liner to con a rich heir only to fall for him. Written for the screen and directed by Preston Sturges, the film is a screwball comedy that is set in an ocean liner where a woman is torn in her feelings for this heir as well as doing the job. Starring Barbara Stanwyck, Henry Fonda, Charles Coburn, Eugene Pallette, Martha O’Driscoll, Melville Cooper, William Demarest, Janet Beecher, and Eric Blore. The Lady Eve is a whimsical and delightful film from Preston Sturges. The film follows a woman who is part of a trio of con artists with her father and a friend of her father’s as they target the heir of a popular ale brewery who is socially-awkward due to his fascination for snakes rather than women. It’s a film with a simple story as it explore a woman pretending to fall in love with this man only for things to not go her way as she becomes conflicted in her feelings to do her job as well as falling for him. Preston Sturges’ screenplay explores not just who Charles Pike (Henry Fonda) is as this man that just arrived from South America to an ocean liner in carrying a rare snake. He’s also this man who is quite naïve and shy around women until a woman accidentally trips him in Jean Harrington (Barbara Stanwyck) who woos him as she is really targeting him for his money. Jean pretends to be a rich woman with her father (Charles Coburn) pretending to be a colonel yet Pike is accompanied by his minder/valet Muggsy (William Demarest) who is suspicious towards Jean and her father. Sturges’ script would be filled with some stylish dialogue that is very playful as well as carry the story as much of the first is about Pike’s attraction to Harrington as well as the growing conflict in Harrington as she is on the ship. The film’s first half mainly takes place on the ocean liner from South America to New York City as the second half takes place in parts of the city as well as the countryside where Pike lives with his rich father Horace (Eugene Pallette). It is where the film takes a bit of a change in tone where it would become funnier once Harrington would take part in another con game as it becomes something extremely comical with Pike being the cuckold all of a sudden. Sturges’ direction definitely has some elements of style though much of the compositions he creates in the film are quite straightforward. Shot mainly in soundstages, Sturges would play into some of the light-hearted moments that goes on throughout the film as he would use some wide shots for scenes involving big crowds or for a party scene during its third act. Yet, he would emphasize mainly on medium shots with some close-ups to play into the moments between Pike and Harrington as they get to know each other or be involved in something comical. Sturges would also allow these scenes to play out in a few minutes for some shots so that it can focus on the actors reciting dialogue and not show too much or cut immediately during a conversation. For the film’s third act revolving around a party, Sturges would create gags that are very inventive as he knows where to show the joke and moments that do bring in big laughs. Especially as it relates to Pike dealing with the situation he’s in as it relates to Harrington as well as the con he is being roped into with Harrington becoming more torn over her love for Pike. Overall, Sturges creates a witty yet heartfelt film about a beautiful con artist falling for her mark in a socially-awkward ale brewery heir. Cinematographer Victor Milner does excellent work with the film’s black-and-white photography in the usage of lights for many of the interior scenes including the party scene in the third act. Editor Stuart Gilmore does brilliant work with the editing as it is very straightforward in playing up to the humor and some of the dramatic moments it would use some rhythmic cuts for some of the funnier moments of the film. Art directors Hans Dreier and Ernst Fegte do fantastic work with the look of the sets such as the dining room in the ocean liner to the interiors at the Pike family mansion. The costumes of Edith Head does amazing work with the look of the suits that Pike wears as well as the dresses and gowns of Harrington. The sound work of Harry Lindgren and Don Johnson do terrific work with the sound as it is quite straightforward with the exception of a few created sounds for the ship and cars. The musical direction of Sigmund Krumgold is wonderful as it features an array of music from different composers as the music ranges from some light-hearted orchestral pieces to bits of jazz and the pop music of the times. The casting by Robert Mayo is great as it feature some notable small roles and appearances from Luis Alberni as Pike’s chef, Robert Grieg as Pike’s butler, Martha O’Driscoll as Pike’s maid, Janet Beecher as Pike’s mother, Melville Cooper as Mr. Harrington’s associate Gerald, and Eric Blore as a fellow con artist who claims to be a royal in Sir Alfred McGlennan Keith. William Demarest is superb as Pike’s minder/valet Muggsy as a man whose job is to watch out for Pike as he is suspicious about Harrington and her father as he provides some very funny moments. Eugene Pallette is terrific as Pike’s father Horace as a man that is trying to make sure his son finds the right woman while providing some big laughs such as a scene about the whereabouts of his breakfast. Charles Coburn is fantastic as Mr. Harrington as a man pretending to be a colonel in an attempt to swindle Pike from his money as he wonders what his daughter is doing being aware of her own internal conflict. 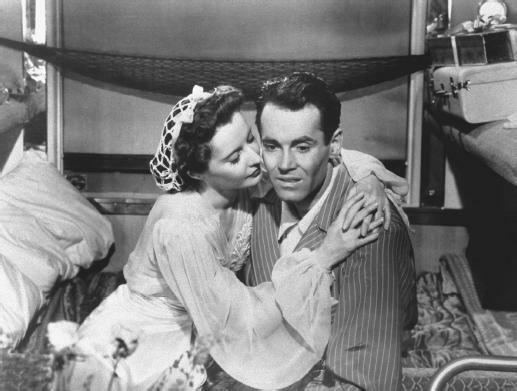 Finally, there’s the duo of Henry Fonda and Barbara Stanwyck in phenomenal performances in their respective roles as Charles Pikes and Jean Harrington. Fonda provides this very low-key approach to his performance as someone that is quite shy and awkward where it his reactions that are funny while he proves to be adept in performing physical stunts. Stanwyck’s performance exudes charm as she says some of the funniest lines as well as be quite seductive and cool where she is a joy to watch. Fonda and Stanwyck together display have some great chemistry and comic timing as they are the highlights of the film. The Lady Eve is a spectacular film from Preston Sturges that features incredible performances from Henry Fonda and Barbara Stanwyck. Along with its witty script, dazzling comic sequences, and top-notch visuals, it’s a film that is a fun romantic comedy that play with the conventions while providing moments that are funny. In the end, The Lady Eve is a rapturous film from Preston Sturges. This sounds like fun. I would give it a try. This is another one I'm considering for my Blind Spot next year as I haven't seen it yet. Glad to hear that it's a good movie. @Brittani-Totally. It's just a fun screwball comedy that always deliver in the laughs. @Wendell-I would totally put this film into consideration as I want to do more Preston Sturges in the future.